CHICAGO – The torch is being passed at Studio Ghibli from the great Hayao Miyazaki (“Princess Mononoke,” “Spirited Away”) to his son Goro, who directs this week’s tender “From Up on Poppy Hill,” certainly not one of the best in the Ghibli canon but a well-made, enjoyable melodrama nonetheless. A full awareness that it’s kind of a cheap melodrama (one of the characters even says so) doesn’t change the fact that it is but the young Miyazaki’s visual palette is notably beautiful and the voice work is strong throughout. Briefly, I thought it was sweet, and how many animated films can we say that about nowadays? Based on a comic and with a script co-credited to Hayao Miyazaki, one of the most important men in the history of animation, “From Up on Poppy Hill” tells the story of Umi Matsuzaki (Sarah Bolger), a gentle girl forced into something of a maternal role in her family. She cooks, cleans, and raises flags every night from her house on the hill to a sailor father who she knows will never return. It is the early ‘60s and he died in the Korean War. The 1964 Tokyo Olympics are coming and Japan is in cultural upheaval while Umi just keeps her routine going. Of course, “Poppy Hill” is about the shattering of that routine when Umi meets the charming Shun (Anton Yelchin), the leader of a house of relative rebels on her school campus. Shun’s house is about to shut down after years of clutter and disrepair have made it a blight in the eyes of the administration but Shun leads a school revolt that mirrors the cultural one going on in the country at the time. Youthful energy replacing strict procedure. He’s a rebel with a cause. And, of course, that draws Umi even closer to him until she learns something about their families that makes their impending love impossible. 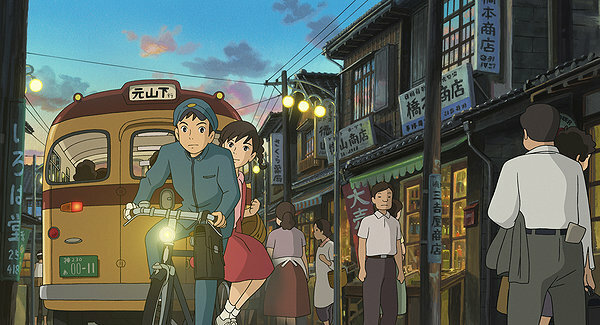 “From Up on Poppy Hill” is essentially a teen romance. It has drama, love, secret pasts, and scary futures. It’s a young adult novel filtered through the artist’s eye of the Ghibli team. And I don’t mean that as negatively as it may sound. While it is essentially a cheap melodrama it is one with a beautiful sense of composition and a gorgeous score from Satoski Takebe. Miyazaki and his team employ a very painterly sense of background, putting a ton of detail into the settings like Umi’s neighborhood and the school buildings. The realism of the piece may be somewhat off-putting to people who expect the fantasy world commonly associated with Ghibli but there’s a gentle charm to this world that places it in the canon. It’s not a fantasy film but it’s a beautiful one. You can almost smell the sea air in Umi’s village. The American voice cast is stellar, fronted by a great, complex turn from Sarah Bolger of “In America” and “The Spiderwick Chronicles.” She imbues Umi with a coming-of-age innocence and yet also a maturity that defies her age. Yelchin is strong as the romantic lead and the ensemble is filled out with great vocal talents like Gillian Anderson, Aubrey Plaza, Jamie Lee Curtis, Bruce Dern, Beau Bridges, and even Ron Howard. 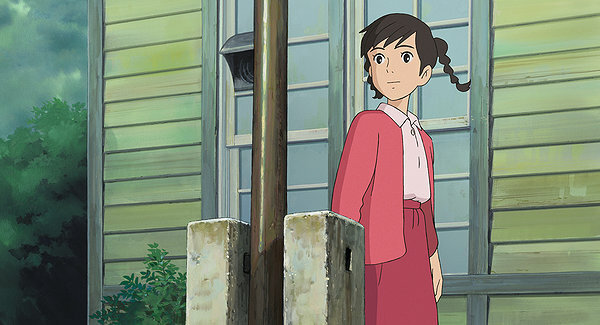 “From Up on Poppy Hill” will be no one’s favorite Studio Ghibli film. It’s not ambitious enough to be truly memorable but I must admit that I found it enjoyable as it delicately unfurled. In today’s market of in-your-face, pop-culture-obsessed 3D mania disguised as children’s entertainment, it’s nice to see an animated family film that could be called delicate. “From Up on Poppy Hill” features voice work by Sarah Bolger, Anton Yelchin, Gillian Anderson, Christina Hendricks, Aubrey Plaza, Jamie Lee Curtis, Bruce Dern, Chris Noth, Beau Bridges, Isabelle Fuhrman, and Ron Howard. It was directed by Goro Miyazaki and will be released in Chicago on March 29, 2013.